Yes okay, well what does this Pierre Cardin Android tablet offer? Well the slate spots a 1GHz Samsung Cortex A8 processor, a 1.3 megapixel front facing camera, 720p HD video playback, Flash content compatible, 512MB DDR II RAM, WiFi, HDMI, MiniUSB , 4GB internal memory and microSD expansion up to 16GB. Now the big let down with the Pierre Cardin tablet, the device is running Android 2.2 Froyo rather than the tablet specific Android 3.0x Honeycomb, which kind of puts it in the HTC Flyer area of devices. The Pierre Cardin Android tablet does apparently support both WiFi and 3G however that 3G connectivity does require the addition of a 3G dongle so not really built-in then. 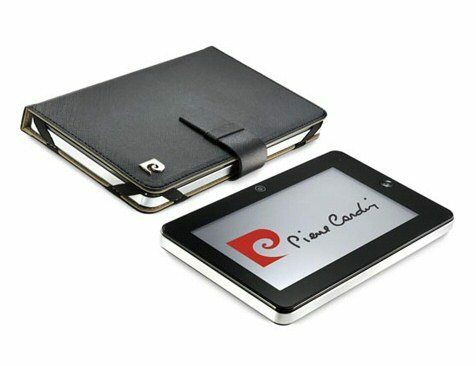 So what will the Android 2.2 Froyo Pierre Cardin PC-7006 tablet set you back? It can be yours along with designer bragging rights for a total of Â£275.00 with free shipping from the Pierre Cardin website. Unfortunately though there is no mention as to whether Pierre Cardin will updated the device to Android Honeycomb at some future point, which tend to make me think that perhaps this little Android slate won’t do too well, still you never know.